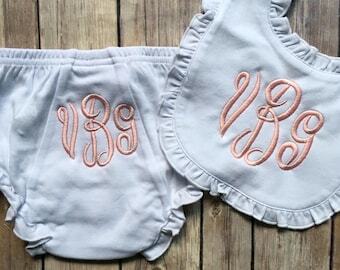 This adorable set of monogrammed bloomers and a monogrammed ruffle bib will be a hit as a baby shower or new baby gift! The adorable bloomers are size 0-6 months, and have ruffles around the edges. 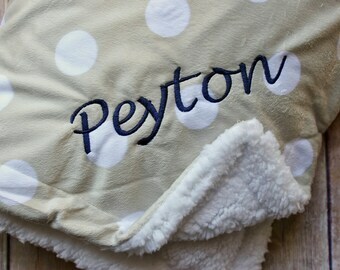 The bib is cotton with a chenille backing, and has a ruffled edge as well. Both items come with the three letter monogram on them. 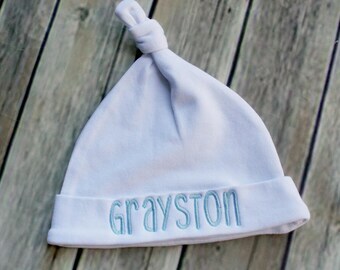 When checking out, please let me know the baby's FULL name so that the initials will be in the correct order. 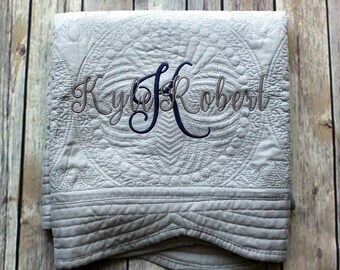 Traditional monograms are in the order first, LAST, middle, so please let me know if you'd like something different. 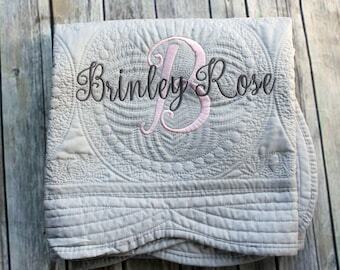 Beautiful quilt and monogramming- love it!